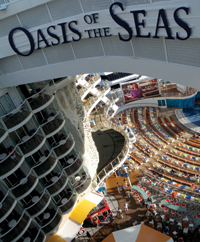 UNBELIEVABLE is a word which my family and I recently used on numerous occasions – we just came back from an unbelievable (here we go again) cruise vacation on the biggest cruise ship in the world, Royal Caribbean International’s Oasis of the Seas. People who are not familiar with sailing across the oceans for a vacation might think that the ports you go to are what cruising is all about. Don’t get me wrong – Sailing from one Caribbean island to the other and visiting little towns with colourful houses, wading through crystal clear water and relaxing on white beaches all definitely have their own charm however since our trip aboard the Oasis of the Seas, we know now that cruising is all about experiencing unforgettable days on board the ship itself. Be it the sheer size of 1,187 feet length and 208 feet width, the capacity of 6,269 guests and 2,165 crew or the unlimited entertainment possibilities – the entire family was speechless when we entered this floating city. As first time cruisers my husband’s sister and his parents didn’t know what to expect but from the moment they first set foot on the ship they enjoyed every minute of it, as did my husband and I. First impressions are very important and it was the friendly and attentive staff that made sure that we were comfortable and pampered throughout the seven-day cruise. With food playing a significant role in our lives, we were ecstatic to find out that there were 24 dining options on board; but there was also downside: the daily challenge to choose a different restaurant and sadly we weren’t able to try them all. One of our favourite places to satisfy our hunger was the casual all-day dining venue Windjammer, we also loved the Park Café and their signature roast beef sandwich as well as the Opus Dining room where we had dinner several times. Since we were travelling on Valentine’s Day my husband treated me to dinner at 150 Central Park, one of the specialty restaurants. We were lucky enough to sample the chef, Michael Schwartz‘s creations as he was on board that week introducing a new menu to highlight his specialty, using Florida-local and organic produce. Needless to say my husband and I were very excited about meeting a renowned chef – so excited that we forgot to take a picture with him when we got his autograph. After enjoying the food onboard so much, we decided to hit the gym. The impressive Caribbean sea view made time past fast and after the shower I was ready for the next stop: the spa. Impressed by the variety of treatments like massages, anti-aging facials, teeth whitening and many more, I sadly only had time for a nail polish change before meeting the rest of the family for the evening entertainment. What amazed us most was the Central Park. Having real trees and plants in the middle of the ship is one of the innovations Royal Caribbean can be proud of – so is the aqua theatre which is one of the largest performance pools at sea. During our time on board Oasis we watched ice shows, Broadway musicals, comedy shows, parades at the Royal Promenade and not to mention, that we were kids again overjoyed at the sight of Dreamworks characters such as the penguins of Madagascar or Po from Kung Fu Panda. The bottom line? We’re hooked – as they say, once a cruiser always a cruiser and it certainly is true.